Ayden is almost 27 months old and has been obsessed with cars and trucks since shortly after his first birthday! Oh who am i kidding…as soon as he was able to sit himself up and push anything with wheels back and forth he has been obsessed. Well our little guy has so many Hot Wheels cars these days that were spread ALL over the house so hubby and I finally decided to do something about it. On our venture to Toys R Us last week we found a really neat Hot Wheels carrying case that is a back pack and he just loves it. It works out perfectly too because it holds all of his cars he has and knows when him and his brother are finished playing with them they need to go back in his back pack. 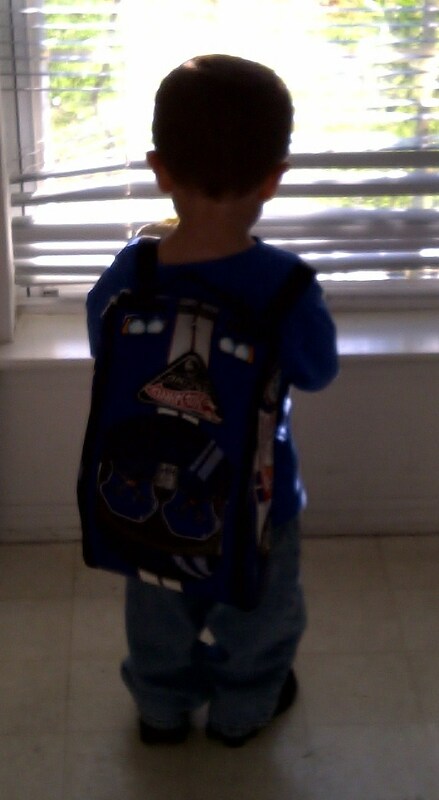 The only problem is we haven’t been able to get him to take the back pack off! Here he is with it!